Meet the Beatles for Real: What can't this man do? T believe this was summer 1968, Hyde Park London. Paul is directing a promo film for the band Grapefruit. 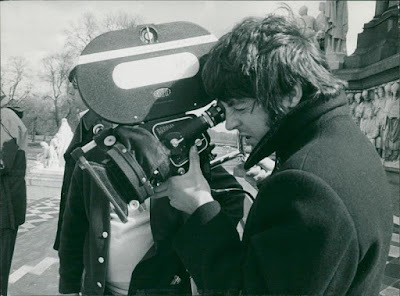 but isn't this Paul at the Grapefruit (outdoor) publicity shoot in '68 ?? May 26, 1968. Hyde Park, London, near the Albert Memorial during a promo film shoot for Apple band Grapefruit. I have Sunday 26th May 1968 as the date, but can`t provide a historical source for this. Yes, he`s wearing a heavy coat, but a dawn start in May can still be chilly. Wow -- now that I have my computer back, this photo looks totally different to me than it did on the tiny screen I was using. I thougth those rocks in the background were a line of girls in bathing suits (from MMT) boy was I WAY off. Now that I can see -- I can tell that this is from January 1968 and the Grapefruit shoot. Thanks for hanging in there with me guys. The film and pic were actually taken in London's Hyde Park on 5th April 1968, after Paul got back from India. The promo is on the "missing" list but is no doubt in Apple's vault.